Labrador Retrievers are a waterfowl hunter's best friend. But they have to learn to retrieve first. Labrador Retrievers are eager to please, especially at a hunter's side in the field. But before they start bringing back the ducks in the water, they have to learn to retrieve. 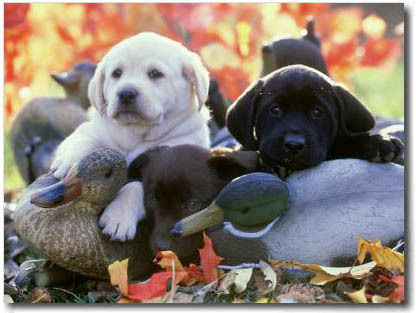 Many hunting dog kennels start training with duck decoys, little stuffed ducks, and lots of treats. Seeing a future hunting dog practice with a toy ducky is probably the cutest thing ever. Here are 11 Labrador puppies practicing retrieving that duck. I think we are just posing for the Christmas card. Shoot, is this the wrong species? I got it in the water! I got it but it won't bite, right? These pups are still learning how to be the best bird dogs. But they will be bringing home dinner in no time! And they would enjoy lots of treats in the process, please.